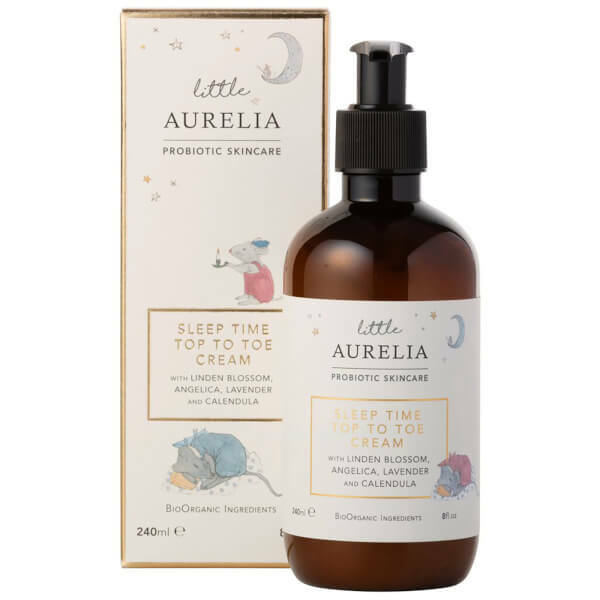 Developed for babies and young children, the Little Aurelia from Aurelia Probiotic Skincare Sleep Time Top to Toe Cream blends soothing essential oils with gentle yet effective botanical ingredients. Combining nourishing Shea Butter and Rosehip Oil with replenishing Meadowsweet and Calendula, the lightweight, silky formula softens and conditions delicate skin for long-lasting comfort. The BioOrganic formula can be used to soothe a flaky scalp, or massaged onto irritated, sensitive and dry skin to keep delicate skin feeling soft, supple and hydrated, without sticky residue. A blend of Lavender, Linden Blossom and Chamomile release a soft, subtle scent to leave your little one feeling calm and content. Aqua (Water), Aloe Barbadensis Leaf Juice (Aloe vera), Glycerin (vegetable), Butyrospermum Parkii (Shea) Butter, Glyceryl Stearate SE (naturally derived), Cetearyl Alcohol (vegetable derived), Coco-Caprylate (coconut derived), Myristyl Myristate (coconut based), Cocoglycerides (coconut based), Borago Officinalis (Borage) Seed Oil, Rhus Verniciflua (Berry) Peel Wax, Rosa Canina Fruit Oil, Lavandula Angustifolia (Lavender) Oil, Prunus Armeniaca (Apricot) Kernel Oil, Cucumis Sativus (Cucumber) Fruit Extract, Calendula Officinalis Flower Oil, Anthemis Nobilis (Roman Chamomile) Flower Oil, Spiraea Ulmaria (Meadowsweet) Leaf Extract, Angelica Archangelica (Angelica) Root Oil, Cananga Odorata (Ylang ylang) Flower Oil, Tilia Cordata (Linden) Oil, Aesculus Hippocastanum (Horse Chestnut) Seed Extract, Avena Sativa (Oat) Kernel Extract, Calendula Officinalis Flower Extract, Chamomilla Recutita (Matricaria) Flower Extract, Persea Gratissima (Avocado) Oil, Helianthus Annuus (Sunflower) Seed Oil, Sodium Phytate (rice based), Glyceryl Caprylate (vegetable derived), Sorbic Acid (natural preservative), Hydroxyacetophenone (preservative booster), Sodium Stearoyl Glutamate (naturally derived), Tocopherol (vitamin E), Lauroyl Lysine (coconut based), Xanthan Gum (naturally derivied), Benzyl Alcohol, Salicylic Acid (vegetable based), Potassium Sorbate, Sodium Benzoate, Citric Acid (derived from lemon), Linalool*, Limonene*, Geraniol*, Benzyl Benzoate, Benzyl Salicylate* (*naturally occurring in essential oils).